Dr. Sloan has no idea his life's about to be turned upside down by the arrival of a young blonde who turns out to be his 18-year-old daughter. He has absolutely no idea to how to cope with it or how to talk to her, even when she stays with him and Lexie through the holidays. Everyone thinks the daughter is a totally out-of-the-blue surprise, but Mark confesses to Derek that he knew his girlfriend 18 years ago was pregnant. He gave her some money, skipped town, and assumed that was the end of it. Now the guilt is killing him. Finally Lexie forces him out of his cowardice and he learns that the girl is pregnant, dropped out of school, was kicked out of her mother's house and has nowhere else to go. We'll be interested to see where this goes. Meredith knows the Chief knows that she knows he was drinking at Joe's. But what's interesting is how he handles it: he offers to become her mentor in the skills lab. His alcoholism was "misdiagnosed" years ago, he tells her - what he really had was situational depression. Astonishingly, she believes him. By Christmas, Meredith and the Chief are practicing skills on cadavers, and she's urging him to make up with Derek. He eventually does, but mostly because of the case Derek's working on with Mark and Arizona. More on that later. At Christmas dinner, the Chief's drinking egg nog - which doesn't go unnoticed by Thatcher, an alcoholic himself. She puts Thatcher in his place, but he's made her think. By New Year's, the Chief's explaining his shaking hands by telling Meredith that he recently had his last drink, and it'll stop soon. Then Joe pages her to the bar, where the Chief is pretty drunk, and we get to see Meredith uncomfortably realize she has to do ... something. Bailey's worried father arrives on her doorstep at Christmas, hoping to find out what's up with her. He's appalled that she has no Christmas tree and that Tuck's away visiting relatives with his father. He's even more appalled that she's fixing some guy's hernia on Christmas rather than being with her family. 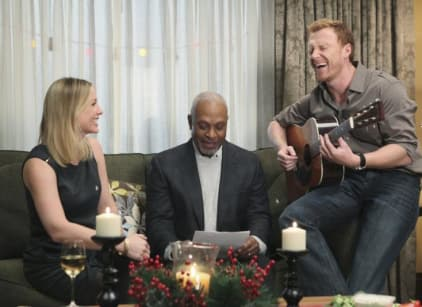 Bailey invites herself to Christmas dinner at Derek and Meredith's, because if her father doesn't see evidence of some kind of life he'll never leave. At dinner, she has it out with him over her life being happy and Tuck's life being happy too. Later, Bailey's dad gets to see Tuck for himself, and realizes his daughter was right, the kid's doing just fine. He and her mother are just worried about her, he says. They make up. Cristina is thrilled to be working with a cardio god, who takes out a woman's heart to outfit her with two devices that keep her circulation going. The patient, Kelsey, is being attended to by her not-quite boyfriend, who went on four dates with her. Turns out he's an amazing guy. Kelsey needs to hang on until New Year's Eve, Cristina says, when the drunk driving accidents will surely make more organs available. She finally manages to get a heart - and a proposal from her man. Teddy and Owen, meanwhile, have been alternately awkward and smitten and Cristina notices the way Owen's been looking at her. Owen confronts Teddy, admitting he had feelings for him and forcing her to admit she's in love with him. Then he says he's in love with Cristina. Cristina confronts Owen, telling him he shouldn't be with her because he feels like he owes her. He plants a kiss on her and assures her he loves her. Der and Arizona treat Nicholas, a little boy with terrible nosebleeds caused by AVM, a cluster of malformed blood vessels in his brain. They convince his nervous parents that he needs surgery, but when he gets in there Derek finds he can't reach the vessels. They don't have instruments small and nimble enough to allow them to go in through his sinuses. But, Nicholas' mother points out, the tools need to be developed by someone, so why not them? Arizona and Derek work with Mark to develop the tool, but they go over budget and their funding gets cut off. They offer to put their bonuses toward finishing the research, but there are no bonuses this year. So they end up splitting the costs between them. On New Year's Eve, the tools are done and they get the job done. Derek: I'll write a check. How much? Arizona: I'll split it with you. Mark: I have a teenager - what if she wants to go to college? Arizona: Have you met her? Meredith: Were you drinking when I was a kid? When you left me with my mother and got another family and never looked back? Thatcher: No. I didn't start drinking until much later. Meredith: Well then, we can't blame the world's evils on alcohol, can we?